news One of Telstra’s main unions has heavily criticised the company for a reported plan to send as many as 1,000 jobs offshore in yet another round of offshoring at the telco, stating that Telstra isn’t treating its Australian workforce fairly in the context of its ongoing profit growth. This month Telstra announced that its profits for the six months to the end of December grew 8.8 percent to $1.6 billion, although its revenues grew only slightly in that period. The company is making solid gains in the mobile sector, where it is still growing strongly, taking customers away from competing telcos Optus and Vodafone as it leverages its superior mobile networks. However, the news came as the company appears set to conduct another offshoring round. 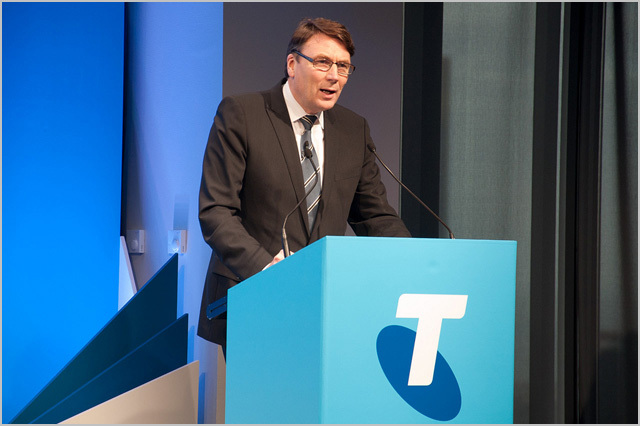 Telstra has avoided sending Australian jobs offshore in the past, but has conducted substantial offshoring initiatives under current chief executive David Thodey. The Financial Review reported this month that the telco could could outsource as many as 1000 jobs to the Philippines and India following a review by two management consulting firms that is due to be completed by the end of next month. “Telstra has made over $3 billion profit every year for the last five years. It remains Australia’s leading telecommunications company with over 15 million mobile customers. This is a strong business but it needs to look after the workforce on whom its profits are built and the Australian community whose strong support has allowed it to prosper,” Tull added. According the union, Telstra announced over 2,000 job cuts last year and based on analysis of Telstra’s business plan, anticipates job cuts in 2014 to be even higher . Regular readers of Delimiter will know that from a political standpoint, I hold economically conservative but socially liberal views — thus, I am largely against government intervention in the private sector and against government intervention in people’s private lives. I am a journalist, after all — but I’m also a small business owner. In this sense, I am forced to say that I don’t agree with the comments made here by the CPSU. Realistically, Telstra is a private company operating in one of the more capitalist economies in the world. It competes directly with telcos like Optus, Vodafone, TPG and iiNet, all of which have substantial offshoring operations. If Telstra did not offshore jobs the way it is, it would find itself unable to compete as strongly with those companies. There is absolutely no need for Telstra to keep jobs in Australia the way the union is claiming. For there to be a level playing field in the telecommunications sector, Telstra must be unrestrained in terms of its offshoring operations. Of course, as many people will subsequently point out, there is no level playing field in Australia’s telecommunications sector, as Telstra enjoys other advantages over the other telcos courtesy of its history as an incumbent. I agree, and in those areas — such as providing access to much of its fixed-line telecommunications infrastructure — Telstra should mostly certainly be restrained, to allow those competitors to compete. But keeping jobs onshore is not one of those areas. Telstra should be able to do as it likes — and indeed, it’s easy to argue that Thodey has a responsibility to the company’s shareholders to cut costs in this area as much as possible, while still ensuring the right levels of service. If customers don’t like the levels of service they will see as a result, then they will be free to jump ship to a rival provider. That’s the nature of market competition. Is all of this unfair to Australian workers? Well, I think the question is somewhat redundant. “Fair” is not a concept which has much traction in capitalism. At a basic level, those workers were selling their services to Telstra. Telstra does not “owe” them a job — it is their job to convince Telstra that they have a service it should buy. If the company no longer needs to buy those services, then those workers should examine their situation and find another company which does, or upskill. It’s a tough concept — but Australia does also have a social welfare system safety net that can stop people starving until they can work their situation out. This seems to be a situation that’s escalating. The automotive industry in Australia is essentially dead since the Australian-made cars weren’t able to compete to provide enough profit to the manufacturers to justify staying in Australia. Telstra offshoring jobs is another piece of the same puzzle. Is Australia a victim of its own past economic success? If Telstra was still government-owned it wouldn’t have a responsibility to share holders to make the maximum profit it possibly could, and those calling the shots would be doing so with Australia’s best interests at heart (that’s the theory anyway). Could this be used as leverage in the argument for fibre to the premises in order to rely less on a company that’s supporting itself than supporting Australia’s best interests? Leasing the existing copper from Telstra was already somewhat controversial given the potential 5-minutes-to-midnight status of the copper network, but add to that Telstra “not supporting” Australian workers could tip the balance of public opinion, and that may be important enough to the current government to take some notice. Maybe. Could we get the union(s) to support a FttP NBN based on the fact it would (theoretically) be better for the Australian workforce? The privatization of government asset has caused a bigger issue than just the offshore of jobs. Prior to privatization Telstra ran one of the largest apprenticeship schemes in Australia, with this disappear we are seeing a skills shortage as the rest of industry hasn’t taken up the slack. This is also compounded by the largest RTO in Australia outsources most of the tasks they used train and maintain a workforce for. That has happened the world over. To such and extent that in the UK they have had to reintroduce apprenticeship programs to transfer skills and knowledge from a rapidly aging workforce. I know that Telstra is now beholden to its shareholders, much like the banks. What most people seem to ignore, unlike the automotive industry’s main players, the majority of the shareholders for these companies are actually the everyday Australians that have money in a super fund! For those of you living in Australia… that is all of us! Few people would have Super savings that aren’t holding at least some shares of Telstra or (all) the banks. So, even though some workers are (understandably) averse to shopping their skills around or (maybe not so understandably for me at least) unwilling to keep their skills growing to stay relevant in our rapidly changing job market, all of them will already benefit (to varying extents) from the increase in dividends! Why do the Unions gloss over that? For the record, I have lost my job several times and have learnt from the experiences to always stay current, and keep options alive, even though I am deeply commited to my current job (whatever it is). It’s not easy to do as industries head towards large-scale offshoring, but frankly, that is the world we live in. It appears that other companies manage to fly below the radar (except for a passing mention as in this article) by doing their job-shedding in dribs and drabs. Has it ever been reported how many Australian jobs have been shed by iiNet in all of its takeovers – and how many offshore employees they have? To be fair, a slow trickle of redundancies is more manageable by society (who can hopefully employ those workers in short order) and by the ones let go as well (who face less competition). Letting go a workforce wholesale, though, is going to send a much bigger ripple, and have a greater effect. So there is a qualitative difference between (e.g.) iiNet’s situation and Telstra’s situation, even if there might not be a quantitative difference. Arguably (and I am making this argument) iiNet is being more responsible. And I am neither an employee, a customer or any kind of fan of iiNet. From the AFR article, “Call centre, procurement, finance and accounting roles would be the main areas affected.” I think that those in a call centre didn’t have much future in the industry to begin with, but should hopefully (with their customer service skills) be able to find work in other industries. Procurement, finance and accounting could probably find work, too. But 1000 at once… competition will be rough. Also, the author of the article appears to have no real issue with offshoring, so your comment is a little misdirected. “Fair” is not a concept which has much traction in capitalism. That’s just it. People hide behind the idea that “the market” will sort itself out and “competition” will deliver good outcomes – but this always assumes a level playing field which never exists in the real world, and this tends to assume the idea of equilibrium which never exists in the real world. There’s always lead and lag (from when the market starts to move to when potentially socially beneficial outcomes are realised), and players starting in a greater position of power have a greater ability to gain more power. Capitalism is not a well-balanced game. When you have one big competitor that knocks everyone else out of the ring, yeah you have capitalism, but you don’t have competition, and when the market has one major supplier of the good or service, well it’s about the supplier’s profits, not the consumer’s outcomes. And who’s an investor going to invest in? The big incumbent with a strong expectation of future profits, or the tiny upstart who wants to disrupt the market? In other terms, it’s a positive feedback loop. The rich get richer, the poor get poorer. It is inherently unfair, and it is inherently not a level playing field. Is that necessarily a bad thing? Well that depends if you’re a winner or a loser. I’m not against capitalism in any sense – as someone who is ambitious and competitive, I like the idea that the more clever and the more cunning can get ahead in the world. Sameness is boring. But, you know, capitalism does not solve problems and should not be championed, it just exists. Competition often does solve problems (although it also generates more waste) – but competition is optional in capitalism; and really, competition exists to distinguish winners from losers, so it is a temporary (or cyclical) thing. If unions think that protecting uncompetitive jobs is ultimately the right thing to do, well I genuinely wish them all the best – because in our society, being unemployed makes you a lesser kind of human. But I think they could be doing more for their workers, like transitioning them to other industries, retraining them, helping them place at other companies, etc. But of course, that’s beyond their scope, and possibly counter-productive for them, and who knows if they have the resources for that? I think that Australia probably must become a knowledge- (and services-)based economy and let old industries die (because we simply can’t compete with our rising Asian neighbours on cost), but Australia has too large a population and there wouldn’t be enough jobs to go around in such an economy. What jobs are inherently “protected”, and cannot go offshore or be automated? Are there any? Maybe the hair-dresser and the masseuse. So really, questions need to be asked. Does everyone need to “work”? Why do we expect someone to work when there is no demand for their work? How does a knowledge-based economy ultimately work, when looked at holistically? Where does the wealth come from? People still need to eat, travel, have somewhere to sleep, etc. Are we going to import all of it? Is such an economy compatible with unlimited growth, and with interest? What are the sources and the sinks? What is the limiting factor? tl;dr: Capitalism solves no problems, it just exists. Protectionism and interventionism solve problems, but also create problems of their own. Is work ethic an outdated concept that should be buried? There is one huge problem with Australian unions. They operate in the wrong country. If they want to save Australian jobs they should be standing up for the rights of workers in the countries the jobs are going to. Meaning it’s okay to throw Aussies out of work because there’s the dole to look after them. Is that it, Renai? What a rarefied world you journos move in. And what happens when you take that to its logical conclusion, and the Australian economy completely collapses? When there’s nobody left to pay taxes, to contribute to Super, to buy products? For that matter, who do you think will be coming here to read this column, see your ads and put the bread on your table? You think you’ll be picking up a lot of new readers from Bombay and Manilla, maybe? Capitalism now equals corporate welfare and crony capitalism. Poor suckers like this journalist believe in the fantasy of a free market and a positively Neanderthal social conservative ‘me’ society. You would have more chance in seeing a Unicorn than actually operating in a free market. They are all regulated, manipulated either directly or indirectly or fixed/fiddled. If you are not on the ‘in’ you are being ripped off – large banks manipulation of the metals markets by constraining physical supply is a case in point and is the tip of the iceberg. While some in our society believe in the idiocy of the free market, ‘financialisation’ and globalisation the economy gets slowly eroded as we fail to protect our own ability to create wealth. Other countries will happily plan to take our jobs while we impoverish ourselves. Not very smart is it. Look at what is happening to the US. I wonder how many workers that are affected by job cuts and off shoring in this country, are told by their employer “up skill and your job in this country is safe”. telecharger fifa 14 gratuit incorporates a big position inside United states Lifestyle. individuals usually are produced together by this particular. telecharger fifa 14 gratuit can be regarded as the outcast. It’s not necessarily common process to help affiliate economics along with telecharger fifa 14 gratuit. to don’t have a impact on your financial status, however generally there have been some consequences. states economics as well as won’t be overlooked. negative way effect environmental surroundings whatsoever. streams, lakes, oceanic masses, etc… In reality, telecharger fifa 14 gratuit made many positive effects with the lovely minor mother nature. upon profitable their particular roles. telecharger fifa 14 gratuit seem to be a more significant concept that many provide credit score regarding. telecharger fifa 14 gratuit just before, however will now commence to provide the credited required and warranted. project, I’ve been in a position to deduce of which megapolis triche isn’t going to negatively result the earth by any means. results with each of our nice very little character.